To achieve a "calendar triple crown" in 2019 — a thru-hike of the AT (2,200 miles), PCT (2,650 miles) and Continental Divide (3,100 miles) all in one calendar year. Since 1994, only four backpackers have been known to achieve this coveted feat, according to the American Long Distance Hiking Association. But Pickering has an advantage — and a strategy. "My background is in running. I did cross-country, I played soccer. I average about 25 miles a day on the trail, but I think I could push it to 35," he says. His plan is to start in February, allotting 70 days to hike the AT, 70 days to hike the PCT, followed by 85 days to hike the Continental Divide. What will Pickering carry with him as he cover those miles? Chris Pickering poses with items from his hiking bag. 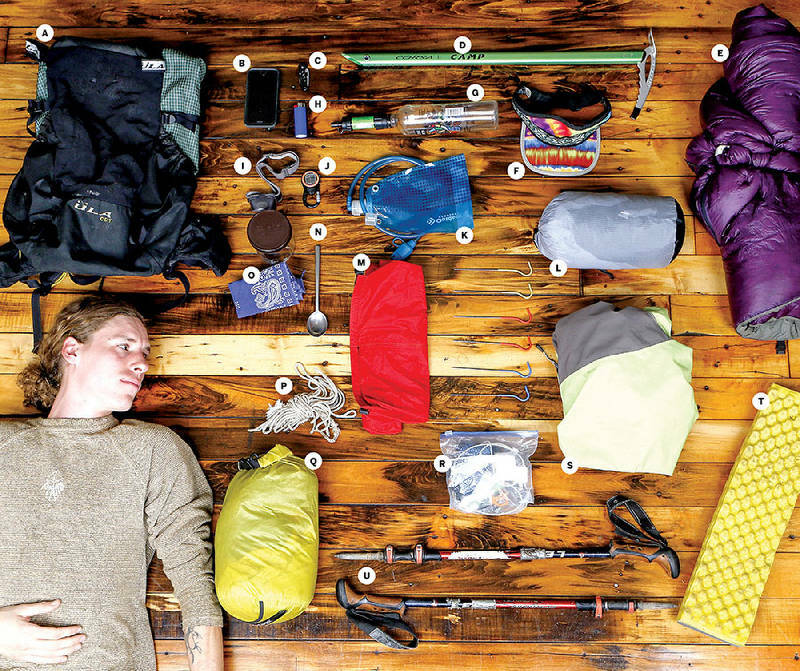 Here is a look at the essentials Pickering keeps in his pack. >>When it come to sustenance, Pickering is into cold-soaking, a backpacking culinary method that forgoes use of a stove. All it requires is a "bowl" — Pickering uses an empty, pint-sized plastic Talenti gelato container with screw-on lid — in which foods such as oatmeal, couscous or ramen can be re-hydrated with cold water. >>For his months on the trail, the only clothing Pickering packs is a wind jacket, an insulated polyester vest, a polyester long-sleeve and short-sleeve shirt, two pairs of socks in which to hike, one pair of socks in which to sleep, and fleece running gloves.